This one comes from the mind of my 7 year old daughter. Over the weekend we were playing Lego Marvel Super Heroes. It’s one of my guilty pleasures, and one of the few games that she plays. Has everything needed – fun gameplay for both of us, collectibles for me, and complete randomness for her (she is hilarious – running around, apologising for stealing cars, searching for her brother… the girl is insane). The discovery comes from the games unlockable characters, found in the form of studs in the game. Until you unlock the character, they appear only as a shadow. My girl was so proud when she was about to unlock Yoda. I tried to explain that it wouldn’t be Yoda but she was adamant. I took a look, and she wasn’t far off TBH. The figure in question was Super-Skrull, one of the big Fantastic Four villains. A quick look and a little bit of recollection, and I realised that some of it may begin to add up. I’m not a Star Wars fan as such. The movies are good, perhaps, but I’m not the sort of geek to go nuts telling people facts about it. The only thing I know, is Yoda’s species – or lack thereof, so I did a little research. Confirming what I thought – we have no idea of Yoda’s species, or his home planet – he is on Dagobah in exile. If you look at the similarities, you can certainly see the Lego versions are alike, but even within the comics and fandom, they look quite similar. The Skrulls were created 10 years prior to Star Wars, meaning there is the possibility of them being an influence. Copying other media is practically a must, as being unique is very difficult now. they are also a species with many Marvel-esque effects – mutations, superpowers. I know that being a Jedi was explained by the midichlorians (I know, sore subject) but that is in essence a description of why they have powers. 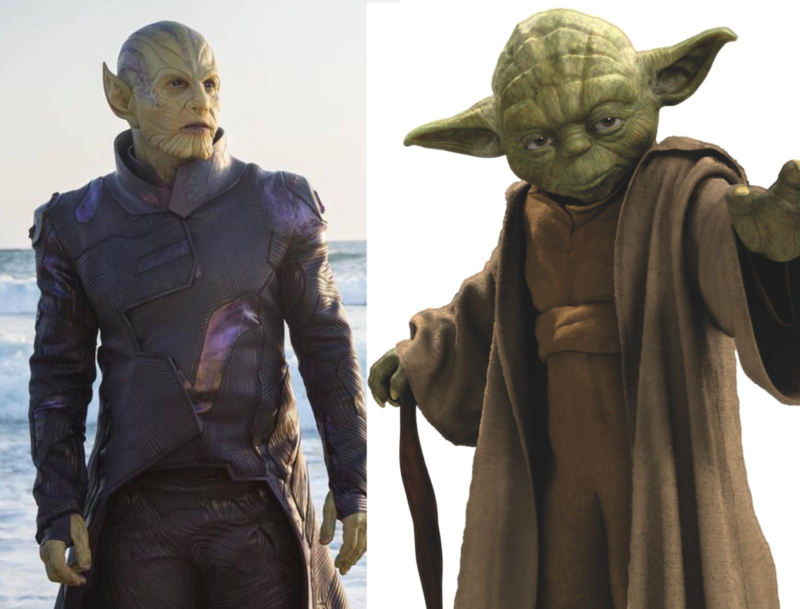 I’ll admit, the Skrulls shows are much taller, and smaller eared – but then, Yoda is almost 900 years old. Humans shrink, and another human trait is that ears never stop growing. The Skrull being distinctly humanion, this makes some sense too. So I present a what-if? What if Yoda was intended to be a Skrull all along. Yes he looks a little different – but like humans they are shown to have unique traits. Perhaps his ‘exile’ and lack of species was just a way to cover up. nothing to prevent is from being explained later on… apart from the lack of rights. But now Star Wars and Marvel are aligned!